iPad-owning pinball wizards rejoice! OOO Gameprom’s The Pinball HD has made its way to Apple’s tablet. 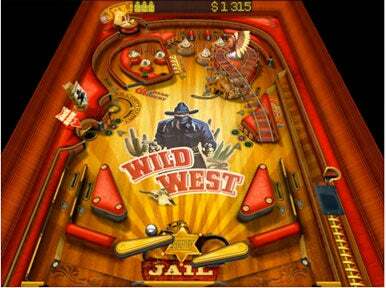 The $3 game features three pinball tables—Wild West, The Deep, and Jungle Style—each with unique graphics, instructions, missions systems, locations and characters. Each of the tables in the iPad version of the game is inspired by a trio of Gameprom’s iPhone offerings—Wild West Pinball, The Deep Pinball, and Jungle Style Pinball. The Pinball HD can be played in landscape mode, giving it a “full table” view, or portrait mode, with a “flying camera” view. Complete with realistic physics, camera effects, local and global high score tables, and built-in help for the pinball tables, this is about as full featured as pinball games tend to get. Gameprom also claims that the 3D-engine maxes out the iPad’s capabilities, so expect some impressive graphics indeed.